Whether you enjoy the low lit atmosphere of a whiskey lounge or would rather spend your time in the rowdy and hearty den of a dive bar, San Diego is home to some of the best bars and lounges on the West Coast. San Diego’s wide selection of cocktail lounges offer creative and delightful beverage programs for patrons of all tastes. No matter what your drinking preference is, whether you’re true to the tradition of classic cocktails, or enjoy modern spins on drinks curated with seasonal ingredients, San Diego’s cocktail culture is sure to have a local watering hole for you. West Coast Tavern is a relaxed environment, housed in an urban style tavern inside one of North Park’s most historic buildings. If you’re looking to grab some grub with good company, West Coast Tavern serves their full menu until 10 PM, a limited food menu from 10 PM – 12 AM, and they keep the party rolling with cocktails served until 2 AM. As for their cocktails, their menu includes a selection that’s specifically tailored by their own bartenders. Whether you’re looking to relax and enjoy your dining experience with friends or stay out late with the night owls, West Coast Tavern has the right drink to accompany you throughout the evening. Prohibition Lounge claims to be San Diego’s most elusive bar, offering a nostalgic drinking experience reminiscent of the Roaring Twenties, and it captures the essence of adventure every night on the town deserves before you walk through the door. Prohibition Lounge is a speakeasy, and finding it requires a fine eye. While you walk down the Gaslamp Districts 5th Avenue, look for El Chingon. The entrance to Prohibition is a secret door under the guise of Eddie O’Hare’s Law Office located nearby. Once you find the door, wait for the light to switch on and they’ll bring you down, where you’ll be transported into the underground world of the Prohibition era. Prohibition offers a small, warm, and intimate atmosphere, where you’ll be able to sip from masterfully crafted cocktails, as well as enjoy live music that’s as gold as the era and different nightly. Wednesday is Tiki Night, Thursday brings Soul, Friday gets lively with Jazz, and Saturday is dedicated to the Blues. Other notable events include a “Weird-Off” competition between guest bartenders, competing to make the best tasting/ weirdest cocktail possible, and a Scotch Counter that serves over forty single malts on Friday and Saturday nights from 9 PM – 1 AM. If you’re looking for an experience that deviates from the modern norm, Prohibition Lounge welcomes you to join them on a trip back in time. Open Wednesday-Saturday from 7 PM – 2 AM, and with a first-come, first-serve seating, you’ll want to be sure to arrive before 9 PM. Aside from a historic and unique atmosphere, Prohibition maintains four house rules to preserve the experience. No cell phones at the bar. Drink with an open mind. No unsolicited advances on female patrons. Keep things chivalrous and gentlemanly. Dress code is enforced Friday and Saturday. No flip flops, activewear, shorts or ball caps. Cocktail attire/ shirts are encouraged. Gentlemen need to be in a collared shirt, pants, and closed-toe shoes. Elicit remains a testament to everything you want during a night out. At this popular El Cajon lounge, you can find music from live DJs, delicious dining selections, and a selection of cocktails, craft beers, and wines that can satisfy any palette. 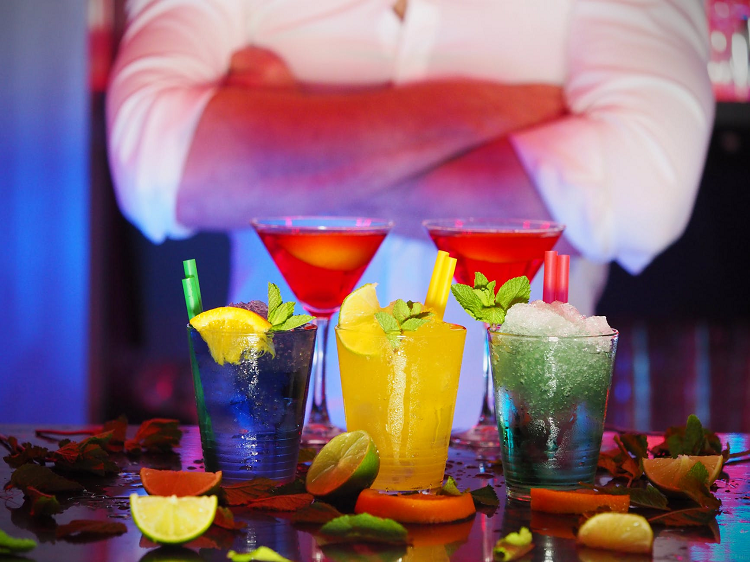 Elicit Bar & Lounge is located within the brand new Sycuan Resort, and it’s the perfect start or ending to any evening. With experienced and skilled mixologists, their cocktail list boasts age-old classics that are everyone’s favorite, as well as new creations that constantly update due to the passion, creativity, and dedication the mixologists have for their craft. If you’re looking for a more intimate mixology experience that’s unique and upscale, their cocktail cart brings the experience tableside, where you can watch the skills and techniques our mixologists use to craft a cocktail for you like pairing fresh juices and garnishes with fire and smoke. Aside from a refined selection of drinks, the menu features a variety of Asian dishes, including hand-rolled sushi, and they offer a raw bar containing a variety of fan-favorites, including half-shell oysters, black tiger prawns, clams, shrimp, and crab. A night out at this bar & lounge is sure to elicit a good time. Located conveniently on Louisiana Street in North Park, Louisiana Purchase is a cocktail restaurant designed by Architect Jeff Svitak that combines the modern world with the classicism of New Orlean’s French Quarter. When you walk in, you can expect elements of wood, marble, and rich velvet, as well as a seamless entrance between the patio and indoor dining space. Louisiana Purchase offers a rotating food menu dedicated to the best seasonal ingredients divined from Cajun inspiration with a kitchen lead by Executive Chef Quinton Austin. Austin relocated to San Diego from New Orleans, and he brings a culinary knowledge and experience versed in the region that can’t be recreated. Some of his dishes that are a must for any guest include the Alligator Cheesecake, Andouille Fried Red Beans, and Rice with Chipotle Mousse. Louisiana Purchase also offers a cocktail bar that captures the spirit of New Orleans in a more refined light, offering modern spins on classics like the Ramos gin fizz and the Sazerac. And if you find yourself enjoying the atmosphere, Louisiana Purchases food and beverage menu is constantly updated to provide guests with new reasons to return. For an experience that’s as wild and fun as Nola, look no further than Louisiana Purchase. Cris Liang and Joon Lee, owners of Common Theory Public House, are behind the new speakeasy, Realm of the 52 Remedies. This new cocktail bar pays homage to Chinese and Korean cultures, inviting you and your palette on an adventure that features imaginative cocktails and dishes incorporating pan-Asian ingredients. A visit to 52 Remedies behind when you walk into Common Theory Public House, however, that quickly changes when you enter the frosted glass door to the left of Common Theory’s entrance, and are welcomed into an elegant space with all white decor, housing shelves of herbs and remedies, meant to serve as a mental reset before transporting you into a distant future. Once you enter 52 Remedies, the environment changes to an architectural space that draws inspiration from Asian heritage, opium dens, and art deco. As for the cocktails, Chris Lee of Bar Old Fashioned in Seoul has developed a menu split into three categories: specialty, classic, and global, depending on your taste. Chris Lee also maintains a tight grip on his staff, placing a focus on the presentation and theatrics behind the craft of each drink, making it as much a pleasure to watch them pour your drink as it is to take the first sip. And with a menu that changes depending on what’s fresh, items are constantly evolving to be perfectly paired with your cocktail of choice.